What I think is a good life is one hero journey after another. called to new horizons. Each time, there is the same problem: do I dare? 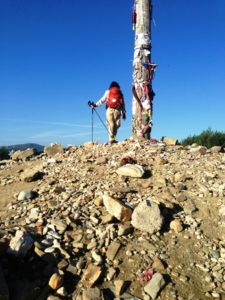 It has been more than two years since I walked the Camino de Santiago de Compostela and even now when it comes up in conversation and people always react with amazement, it always, in turn, prompts a memory of how amazed I felt when I did it and gets me wondering just how did this amazing and defining experience happen. Prior, the idea of a pilgrimage was never on my list of things to do. Well, what I mean is a pilgrimage in the traditional meaning. Since young adulthood, I’ve been a traveler and by my estimate have traveled to some 27 countries and 43 states. While some of these travels were for business, most were as a tourist and it was in this role that I undertook and experienced visiting spiritual and sacred sites. Walking every step of the way on the Camino Frances of the Camino de Santiago de Compostela, I experienced and learned firsthand the differences between a trip as a tourist, and a journey as a pilgrim, and how a pilgrim, with clear intention and with purpose, embarks on a journey not knowing what will happen along the way, its outcome or after affects. 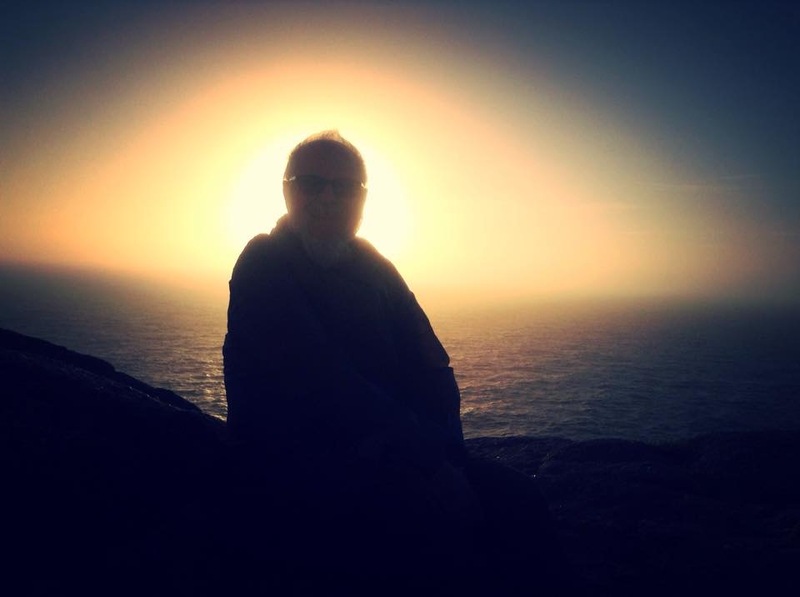 Like the significant, profound and altering spiritual experiences I have had in my adult life, such as my first Foundation for Shamanic Studies workshop, Naraya sacred dance, and visit to Joao de Deus in Brazil, I had no prior knowledge or recollection beforehand hearing about the Camino de Santiago nor, on the outside chance that I may have, did I give it any weight or importance for it to stick. It did not register with me until I saw the film, The Way, which planted the kernel of an idea that ultimately set in motion a decision to do it which slowly, and serendipitously like the others, became a plan and was shaped into form. Upon reflection, I’ve come to realize that without much or any previous knowledge about them, and with a hefty degree of trust, all of these momentous spiritual experiences were presented to me as invitations. Invitations received from Spirit to step into an unknown and unfamiliar cauldron which held the potential for initiation, change, growth. 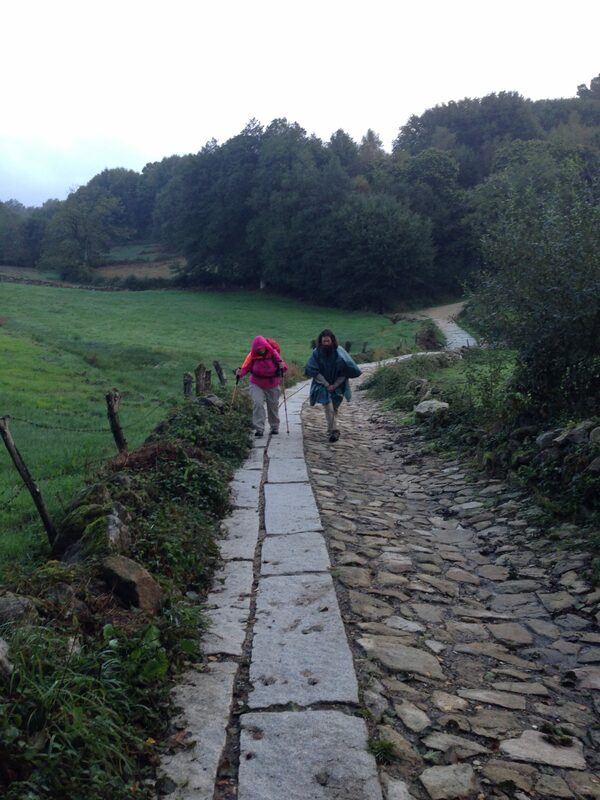 Walking the Camino de Santiago was such an invitation. In early 2014 I made the decision to I retire from my 15 year career as a university administrator. 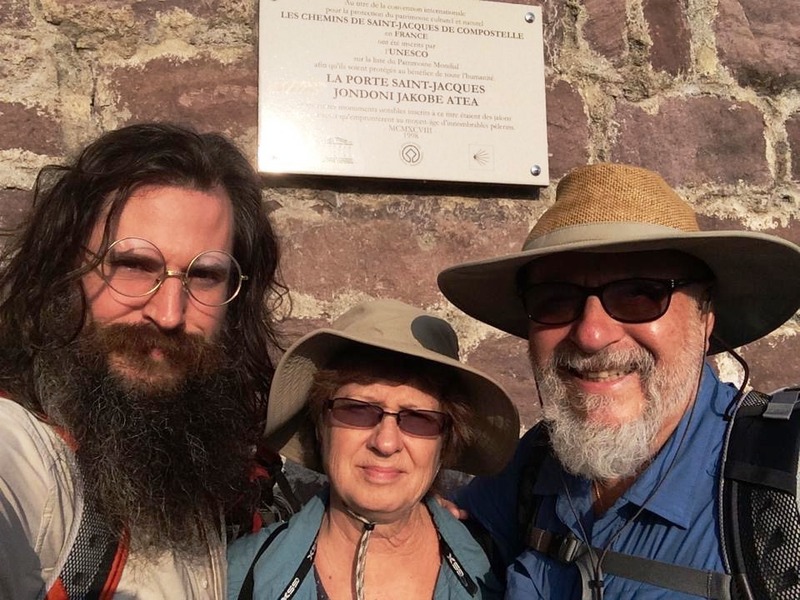 It was about the same time that my friend Dominic, who I had met 10 years early in Brazil at Joao de Deus, told me that his mom, Karen, informed him that she will need to realize her long held dream to walk the Camino that year, when she would turn 65, or give up the idea. He was committed to accompany her. While it was “now or never” for Karen, and “sure why not” for Dominic, for me the idea to walk the Camino in 2014 resonated as falling into alignment with my decision to retire and to mark my transition by doing something very big and very definitely out of my comfort zone. Without much hesitation, I said yes, the invitation was accepted, and actions put in place to begin shaping my pilgrimage. Over the ensuing months, between saying yes and my very first step on the Camino’s path, moments of hesitation and doubt crept in feeding the waves of my uncertainty, fears, and emotions as I slinked along in my processes of becoming a retiree which meant the end of an identity, position and status and the start of something new and unfamiliar, and a rather mysterious status in life. 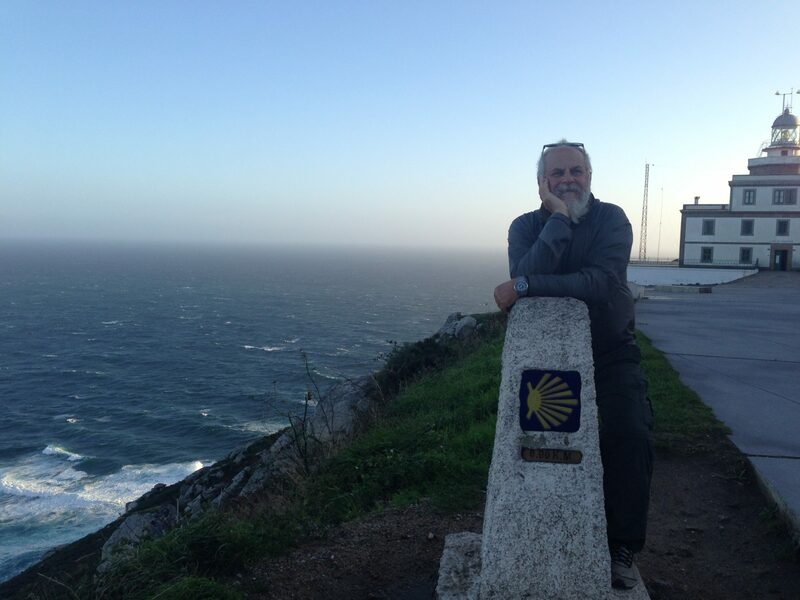 Layered upon my major life change, and hoping to counter the demons of my fears and concerns, was this decision to walk an ancient and sacred footpath across Spain that Druids, Celts, Romans, Iberians and Catholics walked for hundreds of years to The End of the Earth, Finisterre! This idea began to charge me with purpose and I embraced more and more the need and importance to do this ritual to consciously mark and celebrate my transition into the last epoch of my life. Retiring and walking the Camino went hand-in-hand, and became one and the same, during the months before my last day at work and, a month later, my departure for Spain. On September 1, a month after retiring and celebrating my 68th birthday and after months of planning, researching, deciding, purchasing a modern pilgrim’s gear and clothing, practicing 8 to 15 miles long walks, we flew from New York City to Toulouse France, with the simplicity of a my pilgrim’s small backpack, weighing 16 pounds, and continued by train to Lourdes. Lourdes was the portal for my Camino and I could feel the timeless sacredness and comfort of this place of vision, faith, and healing. We stayed two nights, shed some jet lag, ascended a peak to view the Pyrenees’ landscape, and participated in city’s traditional Marian rituals and ceremonies. From Lourdes we travelled by train to Bordeaux and transferred to a bus that would deposit us in St. Jean Port de Pied, the traditional starting point on the Camino Frances. This last leg added a very tangible wash of excitement and reality because the bus was filled with fellow Camino pilgrims, peregrinos, wearing variations of the pilgrim’s uniform made of easily washable synthetic clothes, carrying their backpacks upon which was attached a scallop shell, the traditional pilgrim’s badge and symbol of St. James the Apostle, whose relics were entombed in the Santiago de Compostela Cathedral, and with walking poles or staff in hand. In St. Jean we experienced our first taste of sleeping in an albergue, a pilgrim hostel or refuge, that dot the Camino. Albergues vary greatly and are found in converted churches, convents, monasteries, municipality buildings, and privately owned dwellings. All have standard similar features: bunkbeds, for as few as 4 to as many as 150 pilgrims in a room; some have less common semi-private and triple rooms; shared bathrooms and showers; laundry basins and clotheslines; and either a communal kitchen to prepare food yourself or the offer of a three course pilgrim menu. In St. Jean, we also had our first taste of a pilgrim’s menu the novelty of which wore off with each passing day. We registered at the Pilgrim Office to have our Camino passports officially stamped and dated. Pilgrims carry a passport, a credential, which they need to have stamped at each place they spend a night. 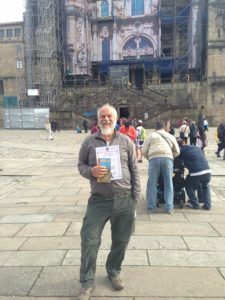 Having your passport stamped becomes a ritual and protecting it becomes very important because it is proof presented at the Santiago de Compostela’s Cathedral Office to receive your Compostela certificate confirming and validating that you walked the Camino’s minimum distance. At the Pilgrim Office, we also got our scallop shells and attached them to our backpacks. There is a saying that your Camino, like all pilgrimages, begins the moment you step foot out your front door. 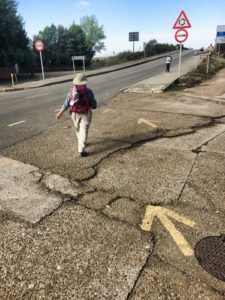 I met several Europeans who would do a segment of the Camino annually, one or two weeks at a time during vacation, until they completed it and others who literally began by walking out their front doors and continuing until they arrived in Santiago. We made the decision to walk the Camino in September and October hoping to avoid the hot summer’s temperatures and crowds. Over the past 40 years, the Way of St. James, with its several routes to Santiago, has grown in popularity as an activity to experience for many reasons. Most of the people I met were on a Roman Catholic or spiritual pilgrimage. I also encountered people who were doing it as an extreme challenge sport, like Ironman, for an increasingly popular adventure, like Burning Man, and others for the “hell of it” with maybe the reason revealed later. The Pilgrims Office of the Cathedral of Santiago recorded 67 pilgrims in 1972 and more than 216,000 in 2014, with over 152,000 walking the Camino Frances. That’s a lot of people, a lot of company, which sometimes strained the route’s infrastructure, especially finding accommodations after a long day’s walk, but also allowing for some very fabulous opportunities to create community and build friendships. In the early morning of September 5th, geared up, backpack strapped on, walking poles in hand, and feeling a mix of excitement and apprehension, I stood with Dominic and Karen at Porte St. Jacques, pilgrims starting at the beginning, ready to seek and follow the markings of yellow arrows and scallop shells that would guide, and to place footprints on top of the footprints left by the multitudes, many Ancestors, who came before. I was at the beginning of the path I would walk for 45 days and on all manner of terrain: stone, dirt, rock, sand, boulders, cement, asphalt, grass, mud, pavement, on ancient Celtic and Roman roads, across landscapes, mountains, forests, plains, farms, vineyards, highways, rivers, and through villages, towns, cities, and in all types of weather from a sweltering 97 degrees to bone chilling temperatures and rain storms. It was on this path that stood before me where I met Creator and all creations, in every form, at every turn. Different than being a tourist visiting a sacred place, I believe that sacrifice and suffering are essential for a pilgrimage experience just like they are for a spiritual ritual, initiation and transformation. The question, the choice, arises frequently on the Camino as to how you step into, deal with, reject, resist, accept or surrender to suffering. My first day was a day of intense suffering walking 16 miles along Route de Napoleon that crossed Col de Lepoeder, a 5,000 foot mountain, which marked the border between France and Spain, with no town between the start and end points. There were two places to refill water bottles. It was pilgrim’s initiation by Fire, a brutal and hellish path, and yet supremely beautiful with moments walking through fogged forests and standing above clouds, that branded the pilgrims who did it with a badge of accomplishment compared to those who took the easier route along the road or started on the other side of the mountain. There were many other badges of accomplishment, to humble mine, like meeting people who started their pilgrimage in Munich, Stuttgart, Brussels, Lyon, or further away. After that first day, arriving at our destination some nine hours later, very late, tired and hungry, I told Dominic and Karen I was prepared to give up if the rest of the Camino was going to be like that. 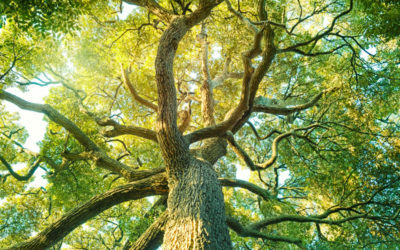 My reaction was mostly bluster because, as exhausted as I was, I knew from experience, and my shamanism practice, that when an intention is set in motion energy is created with its primary goal – completion. If left unfinished, the energy remains engaged, stuck, within an incomplete cycle which can feed limiting beliefs and patterns. Walking took on a rhythm and I became more and more conscious that walking was the primary mode of travel, to get from one place to another, for our species for millennia, how Time was experienced differently in how everything slowed down, and how I had an immediate and intimate relationship with my surroundings: with the Earth, movement, cycles, creation, senses present to sights, sounds, smells, tastes and touches that are not available riding in a car, train, bus or plane. A rhythm that oftentimes felt like the steadiness of a drum beat, feet and walking poles meeting the Earth, the repetition of wake, pack, walk, eat, walk, eat, arrive, unpack, shower, laundry, nap, eat, sleep, wake – a rhythm that reminded that there was little to be concerned other than this rhythm that hammered my intention to my initiation and marked moments of ease, challenge and chaos with occasions of joy, release and laughter (ah, the laughter!) and tears and suffering (oy, the suffering! ); cheering endurance, resilience and surrender; and awakening to a deeper empathy, compassion and the capacity to live and to love. A rhythm that reminded me to trust, I will be OK, I am safe, that the Camino would, like life, always provide. Each day towards my destination was another day nourishing my feelings of empowerment and accomplishment. Each spoken and heard utterance of Buen Camino inspired my footsteps to continue meeting new experiences, landscapes, challenges. Each of my steps joined the flow of a steady stream of a humanity, sharing whether in silence, words, stories or song, a common goal, that came in all forms: adults, young, old, seniors, teens, parents with babies and toddlers, blind and tethered to human guides, pushed strollers, pushed wheelchairs, canes, single, couples, married couples, groups, from six continents, all races, ethnicities, genders, sexual orientations, religions or none, many languages, with animals, barefoot, first timers, repeaters, some many times, all walking at their own pace, and all revealing smiles and a countenance of profoundly divine grace. I walked with Dominic and with Karen. I walked solo, something often not comfortable for me especially in a foreign place, which offered me opportunities for quiet self-reflection and affirmation. I walked with others, people I met and connected because of our common circumstances and because of that unknown something, call it a vibe, that brings people together, and with people I was introduced. 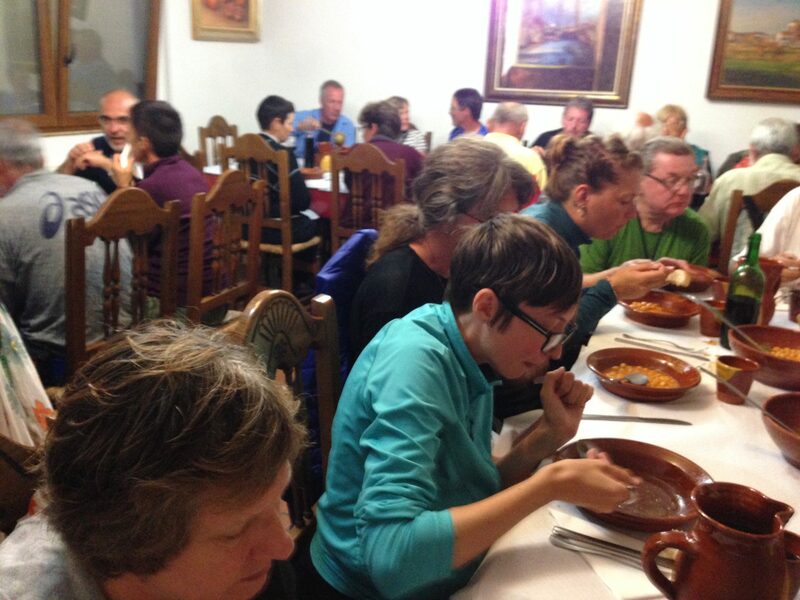 Introductions to others were common on the Camino because the phrase we are family was a fully living experience. We were in this together and we made ourselves available to lift and support each other towards reaching Santiago de Compostela. For a time, I met up with a group of young people who came and went and were from Seattle, Perth, Virginia via India, San Francisco, Korea, and was appreciated as the elder, seen and validated by twenty year olds. At some point we were baptized by others as the Vagabonds of the Camino because we displayed much joy, laughter, singing, and gusto when witnessed as we walked or dined. It was good medicine to counter suffering the many hardships of fatigue, sore muscles, tired feet, blisters, shin splints, sleeping in packed albergues full of sleeping bodily noises, bedbugs, and bad food. 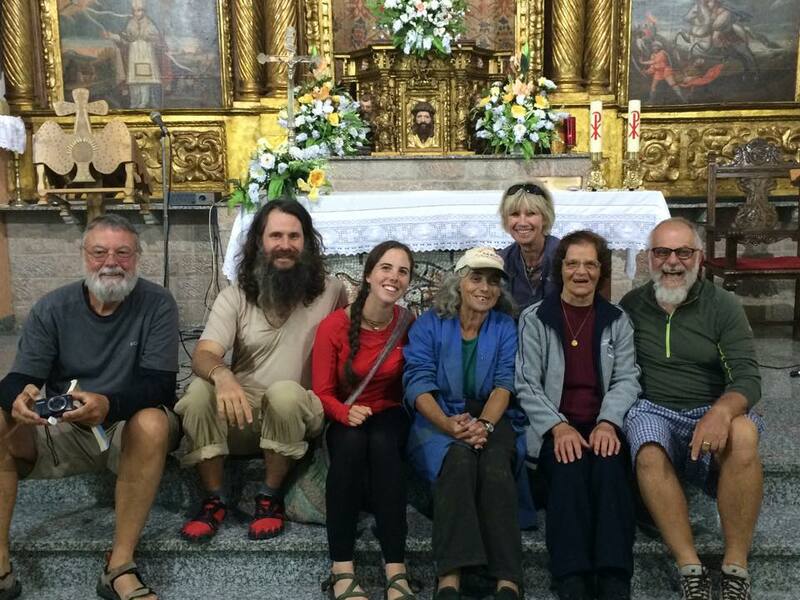 In the true spirit of the Camino pilgrimage, bonds and community were created displaying unfiltered kindness taking care of each other and with no expectation other than to be kind. It was a wonderful reminder of the innate goodness people have and how circumstances can bring it to the fore. Expanding on the traditional ritual to carry a rock from home, infused with a personal burden to be placed at the Cruz de Ferro, Iron Cross, and released, I was inspired to expand upon this and picked up and carried a new rock every day, from dawn to dawn, breathing a new intention into it for the day’s walk. My intention would be for people, places, emotions and feelings, character strengths and weaknesses, the Elements, Ancestors, Spirit Allies, and the many communities and circles I was a part. As I walked, I would pray on my day’s intention and feel the currents of connection in the exchange woven by the packing and unpacking of a rock filled with an intention from one place to another place. It was small, mindful and personal rituals such as this, coupled with traditional Camino rituals that added layers of the divine and the profound: a release on the Alto del Padron, Peak of Forgiveness; drinking red wine at dawn on 9/11 from the Fuente del Vino at the Monasterio de Irache; soaking feet in the healing springs at Arroyo San Bol; witnessing harvest festivals in towns and cities with traditional dances, songs, parades, and bullfights; walking a labyrinth on the flat plain of a mountain crest; leaving an offering at a mountain memorial for the fallen, caidos, killed during the Spanish Civil War; standing in the arch at Sahagun, the geographic midpoint on the Camino Frances; standing with Dominic in the portal of the Puerta del Perdon, Door of Forgiveness; attending Pilgrim’s masses and blessings; asked to say dinner grace in a Benedictine monastery; visiting the Hospital of the Soul in a couple’s home that is part refuge, museum, and place to drink herbal tea, enjoy beautiful things, and quiet the mind; and guided by Dominic in the qigong practices of the Inner Smile and Microcosmic Orbit. 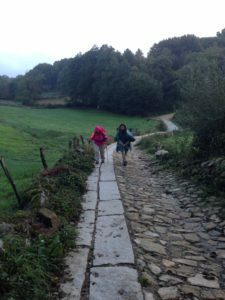 On day 33, I entered the province of Galicia with its lush and green land and vistas reminiscent of Ireland, the British Isles and the Pacific Northwest, which meant very rainy and very wet, and making walking extra tiring and difficult. The cooler October temperatures added to the struggle. Suffering took on new meaning with soaking wet clothes; water drenched boots; very slippery muddy paths; and chilled to the bone. Nothing seemed to fully dry or if it did not for long. By now I was tired; tired of walking, the challenges, the same clothes I wore for weeks, the food too familiar and no longer exciting. Subsequently, I thought it interesting that the Camino Frances is bookended with two extremes and with lots of hard stuff in between. 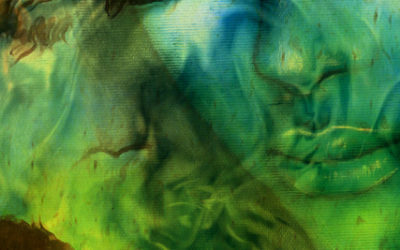 It’s like Spirit said: so OK you wanna do this, alright, I’m going to really test your resolve at the start, let you coast along a bit with some difficulty in the middle, and then as you approach the finish, I’ll test your resilience to see it through. So this is where I called upon all my resources, this is where I remembered from where I came, the exceptional qualities and strengths of my parents, my ancestors who suffered far more and survived, the Camino ancestors who walked to Santiago and then back home, the friends who are dead and whose memories I carry with me, the power of Nature surviving adversity and thriving, and the grace to totally surrender to trust and faith. On the 39 day I made the decision that in spite of heavy rain I would walk the 17 ½ miles straight to Santiago and not stop overnight at Monte de Gozo, the traditional place where pilgrims stay to freshen up before entering into Santiago. As someone told me: “once you’re wet, you’re wet”. The last miles are not pretty and they are less attractive in heavy rain. They are the grittier markings of industry. At this point I was not in it for the scenery and the rain in my eyes made everything gray and blurry. This would be a very internal sprint. My steps and walking poles on mud and concrete surfaces beat a steady rhythm. I stopped at a café to get out of the rain, have a beverage, rest, and was fired to continue by the realization of what I was about to accomplish. I entered Santiago de Compostela with Hussain who I met a few miles from the city line. I had envisioned a different entrance and with different people. Like life, one doesn’t always get what one wants or expects on a pilgrimage, and it’s how one embraces change and the unexpected. Hussain was one year my junior, raised Shite Muslim in Iraq, and a psychologist who lived in Newfoundland with his family. Our last steps towards Santiago where rich in conversation and helped keep us present to something other than the pouring rain. We spoke, him limping with an injured leg, of our lives and experiences living shared decades, reasons for walking the Camino, he a non-practicing Muslim and me a non-practicing Roman Catholic sharing our views on religion and the dangers of dogma, and our opinions about world affairs. A conversation like this, with an immediate feeling of connection, and in unusual circumstances, makes time pass quickly, and is especially appreciated walking in the brutal downpour. With no fanfare, welcoming band, finish line ribbon, chorus of singing celestial beings, sunlight streaming through heavenly clouds, Hussain and I, two pilgrims thrown together by fate, arrived in Santiago de Compostela on October 13, 2014, the day the USA was celebrating Columbus Day, the significance , as an Italian American, not escaping me nor the significance of 1492 when Columbus arrived in the Americas and a newly unified Spain banished Muslims and Jews from their kingdom. It was a moment when rain mixed with my tears and indeed was a miracle! 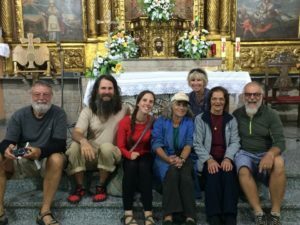 In Santiago I became a celebrating pilgrim in a pilgrim city encountering pilgrims I had met, or heard about, along the way that I had not seen in weeks or days to share congratulatory hugs, smiles, tears, stories, drinks and meals. The excitement was palatable on the line at the Cathedral’s Pilgrims Office where I waited to present my passport credentials and receive my official Compostela certificate. This was it, to have placed in my hand the document, in Latin, stating I did it, walked the Camino de Compostela, and was nothing less than awesome. I attended the Pilgrim’s Mass in the cathedral. 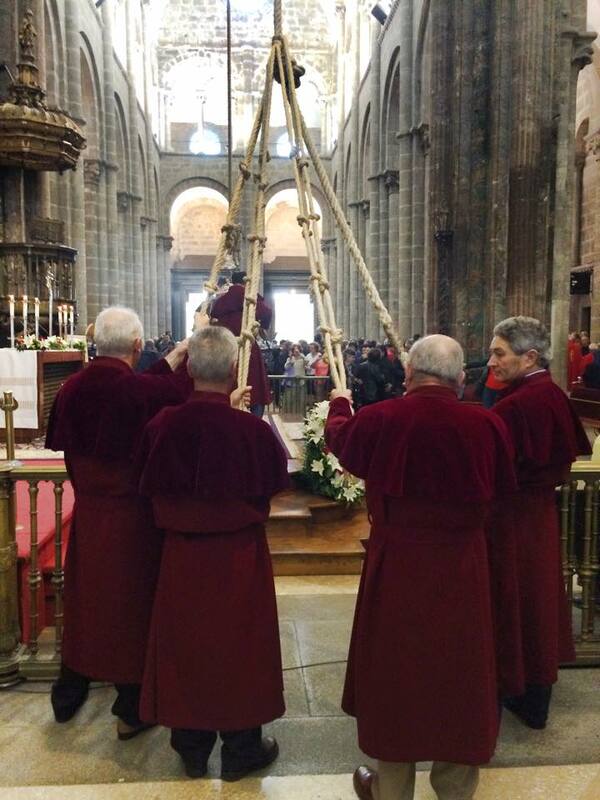 It was a quintessential Catholic ceremony of the highest kind, only as they do it, and culminating with the ritual swinging of the Botafumeiro, an enormous censor filled with incense requiring six robed men to lift and swing it over the congregation. It was also an experience that welled up my eyes with joyful tears and even today, when I recollect, it still does. No matter what one’s belief, knowledge or feelings about the Roman Catholic Church, there was an omnipresent serenity being in such a vastly sacred space, passing before the crypt that legend says holds the relics of St. James the Apostle and caressing his gold bust in its prominent place at the head of the main altar. Because 2014 was the 800th anniversary of St. Francis of Assisi’s pilgrimage to Santiago, the church built by his disciples was giving a very special Compostela certificate which I received. This was very meaningful because of my shamanic relationship to this man who communed with animals and nature. While Santiago is the Roman Catholic destination of the Camino pilgrimage, Finisterre is the more ancient spiritual destination. I imagine centuries of ancestors standing on the rocky cliffs of Finisterra looking at the ocean and dreaming what lie beyond: places of great imagination then as they are today. At Finisterre, the last Camino ritual is to walk on a road, adjacent to the Celtic temple to the Sun ruin, to the Lighthouse perched on a rock cliff overlooking the wind swept Atlantic Ocean with waves fiercely pounding against the edge of a continent. It is the spot where the 0.00 km Camino marker is found, Ground Zero, and the ritual is to burn an article of your Camino clothing. With the wind, it was hard to get a flame lit and very little fully burned. I left offerings, the intention filled rock I carried that day, a scallop shell I carried with me from New York, and a pinch of tobacco. As I did, I thought of the legions of people, including my grandparents, who crossed this ocean and of my home city on the other side. Two days later, and after a message from a dead friend in a dream, I set off on foot to Muxia. Someone told me that while Finisterre is the “End of the World”, Muxia is the “Eye of God” because after you have completed your pilgrimage, stood at the End of the World with your achievement, you were blessed and sanctified to now look directly into the “Eye of God”, and to continue your pilgrimage into the world changed and renewed. It was also the place where I received my third Compostela which stated that “all my sins were forgiven”. On the path between Finisterre and Muxia I lost a scarf that I was gifted at an indigenous sacred dance and that had accompanied me for 16 years to shamanic trainings, ceremonies and rituals. I was informed later that it was on the muddy forest path, stepped upon, and pushed into the earth. 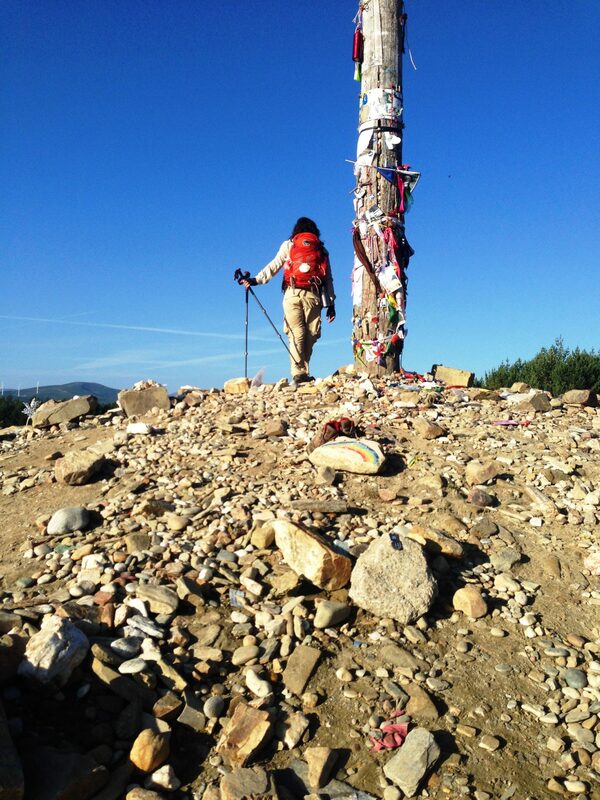 While I did not burn any clothing at the End of the World, I was comforted knowing that I left something, very sacred to me, on the Camino and that it was merging with the Earth. The ending of the film, The Way, was filmed in Muxia, standing in for the less cinematic Finisterre. It has a breathless ocean coast with massive wind sculpted rocks. With an understanding why it was referred to as the “Eye of God”, I stood fully present at the edge of what lay ahead for me, and with volumes of hope, power and trusting my initiation, I decreed, looking Creator straight in the eye, I was ready to take my leap of faith, to say yes to retirement, my new beginning, and fully trust, the time is now! On the train to Madrid, where I would fly home, I felt a mixture of sadness for something so significant to be over and the satisfaction of my pilgrimage. The train ride was quick and a reminder just how fast travel has become over such a short time and with it a loss of the innocence being intimately connected to land, place and people. It took a mere few hours to cover the same distance it took me weeks to do on foot. 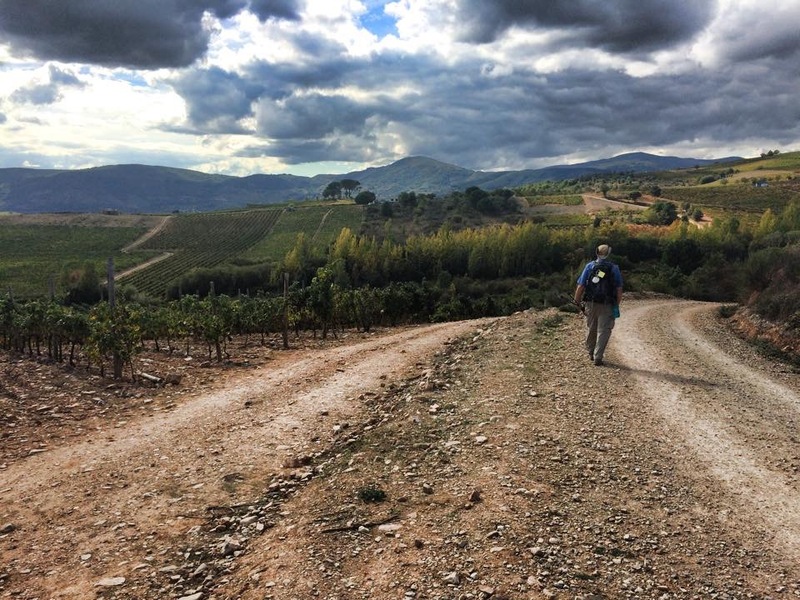 Since my return, people often ask me how walking the Camino changed me. I think they are expecting some profound answer. I remember seeing one handwritten sign along the path, that said to the effect: This is not Hollywood’s The Way, this is the real Camino. What’s different for me is not the big, grand or flashy stuff but rather small and subtle things, little sparks of awarenesses – trusting the mystery, things are not the same, something has changed – that have been stirred, stoked, forged to feed my spirit and that are always available: to be present, to know Life will always provide, to surrender, to trust I was made for my experiences, to be kind, generous and compassionate, to say yes and often, to graciously receive, to possess less, to lighten my load and to only carry what I need, to remember to laugh, to celebrate each moment as a miracle, and to always keep my eyes out for those signs that will show me the way. 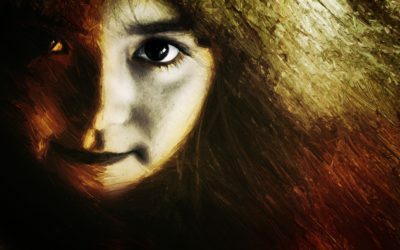 Tony Allicino has been a practitioner of shamanism since 1997 and has taught shamanism workshops, retreats and led rituals at LaGuardia Community College/CUNY, The Open Center, Shantigar, Journeys to the Soul, Spirit Hollow, Kirkridge, Easton Mountain, Menla House, Dawn Manor, and Shamanic Fire Reiki. He has studied shamanism traditions with Michael Harner, Sandra Ingerman, Tom Cowan, Christina Pratt, Nan Moss and David Corbin, Uncle Angaangaq, Ailo Gaup, and indigenous shamans of North and South America and Nepal; and ecstatic dance and movement with Gabrielle Roth, Emilie Conrad and Alessandra Belloni. A participant of indigenous Sacred Dances throughout the United States, he is a Grail Reiki Master, a graduate of Sandra Ingerman’s Teacher Training Program, a member of the Foundation for Shamanic Studies, Society of Shamanic Practice (SSP), and a founding member of the NYC Gay Men’s Shamanic Circle. 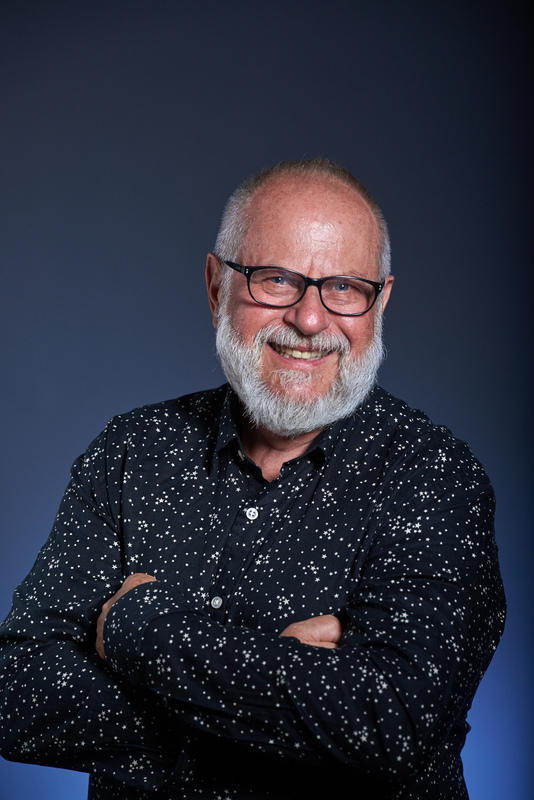 He directed LaGuardia Community College’s Center for Alternative Health and Healing (2005-2009); co-coordinates SSP Northeast 2016 and 2017 Shamans Gathering, and is a Shamanism Without Borders Community Leader. Tony lives in New York City where he hosts a monthly Drum Circle, teaches classes and works with clients.